We were delighted when Steven Hersey sent us a review of our Jackson’s Aqua Oil range saying they ‘represent excellent value for money and are a worthy competitor with other brands’ as well as being ‘clean, smooth and easily manageable’. We asked Steven to send us some examples of his work and go into further about how they work for him. We also awarded him a £25 Jackson’s Gift Voucher for writing the most informative and useful review of the month. 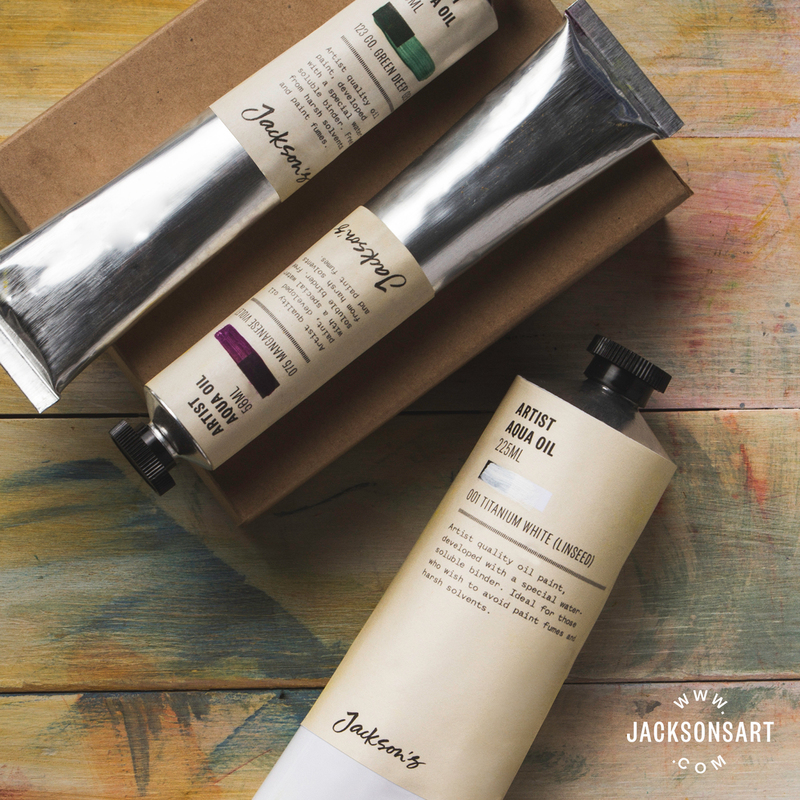 I have been using Jackson’s own brand water-based oil paints for much of this year. I wondered if you would like to know my reaction to them? In short, I have found them excellent. They have performed extremely well in various commissions and teaching sessions and a couple of my adult students have also been using them. Only this morning I shared some painting techniques with a student and we explored various methods using your paints. They are clean, smooth and easily manageable. They mix and blend well and can be thinned to create a wash or straight from the tube without any fuss or problem. 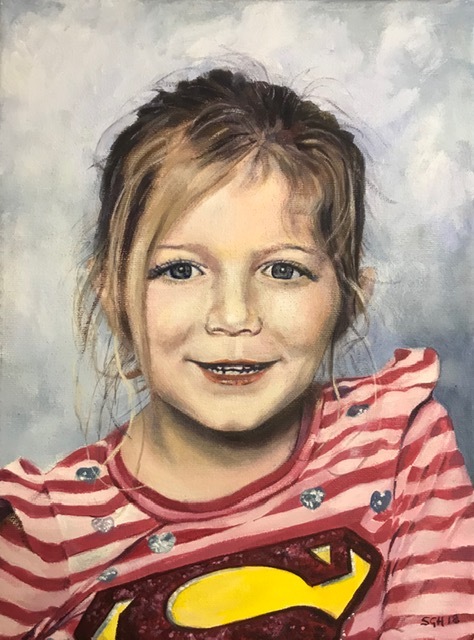 A recent portrait commission has been painted using a mix of your own blends and a couple of Winsor & Newton Artisan paints. The paint has responded extremely well to both rigorous bristle painting and delicate watercolour brush work, all on the same canvas. This morning I placed an order for some more colours. For me, they represent excellent value for money and a worthy competitor with other brands. 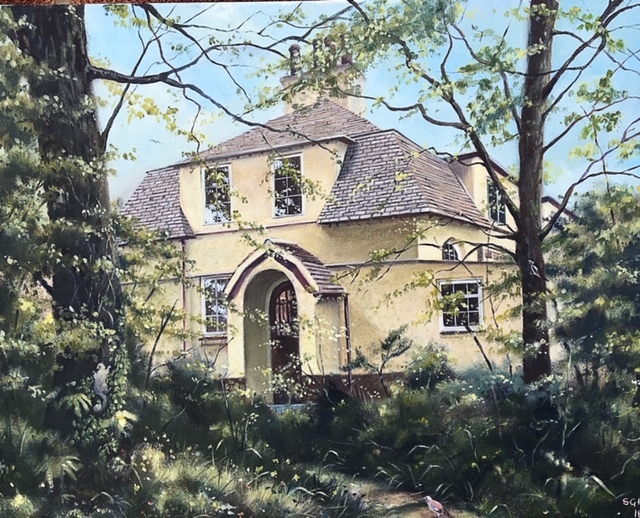 All works included in the post have been produced using Jackson’s Aqua Oil paint. I have found them to be excellent. The following images are all recent (within the last six months), ranging from studies for tutorial work to demonstration and workshop pieces. Portrait and landscape commissions are also included. Study for the above student painting textiles. This one by Lord Leighton. 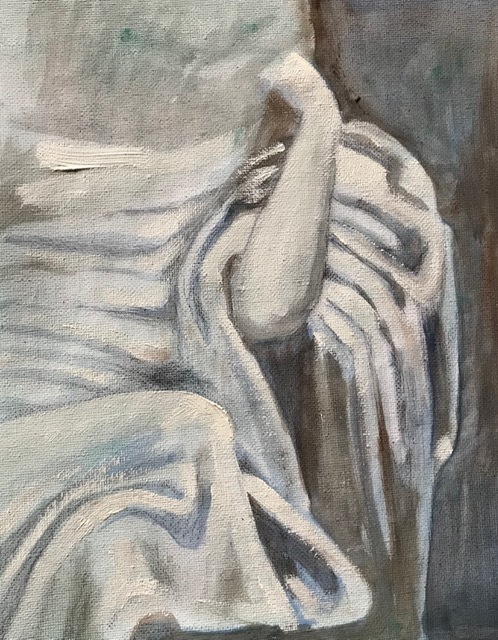 Rough study, thick paint, exploring sculptural values. Canvas paper. Unfinished. 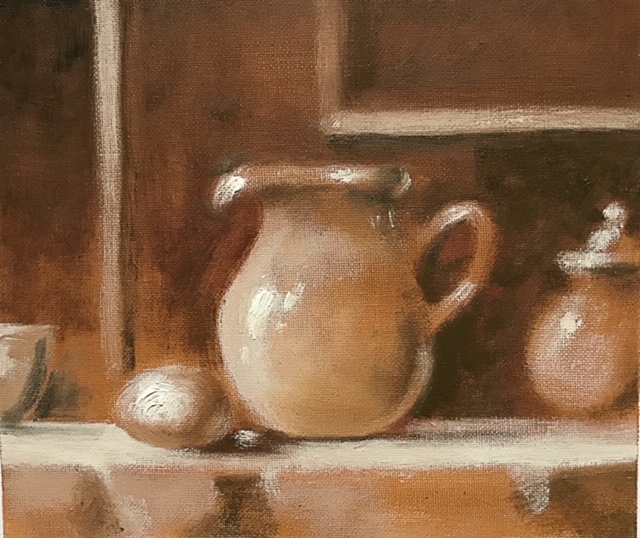 After drawing an initial outline in coloured pencil on the raw canvas, I covered the surface with Burnt Umber Jackson’s Aqua oil paint mixed with a little water-based linseed oil to allow for a smoother application. 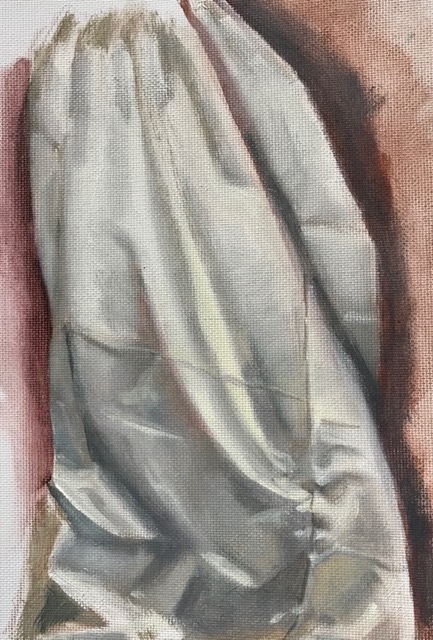 I then used a soft cloth to wipe away highlights to create a semi 3D effect by revealing the white canvas. Different pressures on the cloth plus a variation in how it is gripped (e.g. single finger covered by the edge of the cloth to achieve a finer wiped line) gave different effects and strengths. Directional strokes ‘around’ the pots suggested their rounded shape. Titanium White and Ultramarine were then used and they allowed for further tonal extremes in shading and highlights. The white in particular was applied quite thickly and quickly. 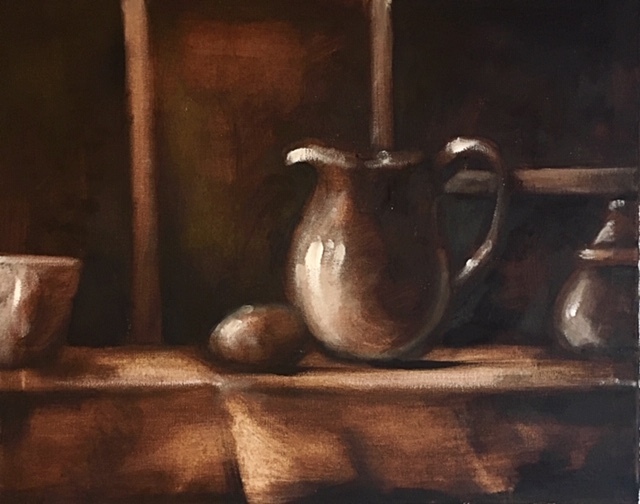 Each of these still life images were done within an hour. Study for still life above. Much lighter in tone. Canvas paper. I am a retired schoolteacher, having taught art at secondary level for over 30 years and adult night school classes for some 18 years. Following retirement in 2011, I have since worked with adults in workshops, demonstrations, home tutorials and, lately, online tutoring for a correspondence college. Commissions have also been received on a regular basis. 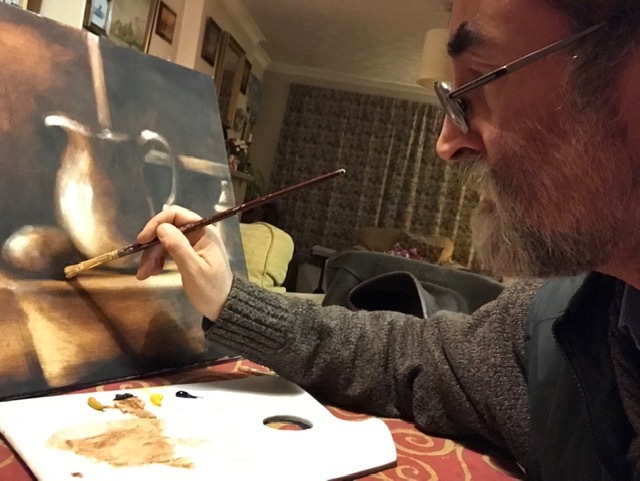 I work in oils, acrylics and watercolour in the main, though I also dabble occasionally in pastels. Drawing is the foundation of all these disciplines, as well as the ability to observe, understand and apply the various skills involved. Most of my art activities are in tutoring and guiding adults as they seek to develop their own skills in whatever medium they choose or wish to study. This means I need a flexibility in and acquaintance of several mediums, as well as a variety of surfaces and accompanying tools of the trade. I learn much from teaching the subject. I live on the Wirral, though I was raised in East Cheshire. My college education took me to Manchester, Cheltenham Spa and then Liverpool for my teaching qualification. I am as busy now as I was when a school teacher. 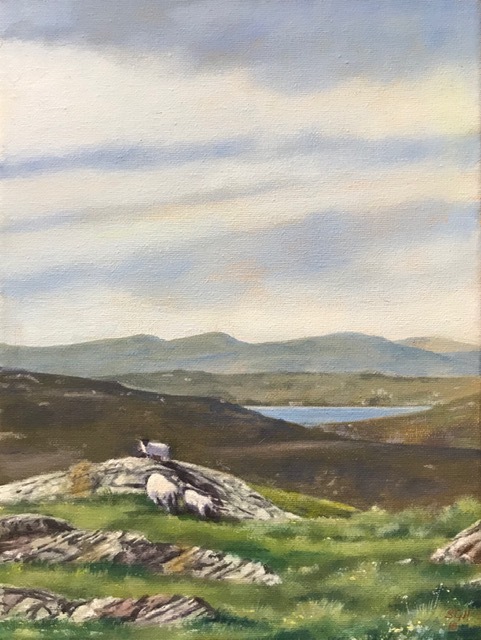 Study for another student who wanted to paint from a photo she took on holiday in Scotland. Canvas. She wished to explore water-based oil paints in this project. If you’d like to contact Steven Hersey for a commission or more information on his work please email him at stevenhersey@me.com. You can view all of our Jackson’s Artist Aqua Oil Watermixable Oil Paints online here along with Winsor & Newton Artisan Watermixable Oil Paints here. The Top image is a Commission for a local client’s house by Steven Hersey, on canvas.